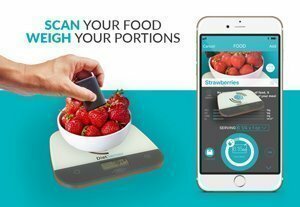 1 DietSensor Digital Scale – send the weight of the food to the DietSensor app via Bluetooth. 1 SCiO + 1 year of unlimited scan – scan your food in one click and get precise values of carbohydrates, fats, proteins, and calories of any food, even homemade, as long as it is homogeneous. SCiO is the smallest and cheapest “spectrometer” available on the mass market, and is part of a new generation of portable spectrometers. It was a huge challenge to miniaturize this lab grade technology to make it available to the public for a reasonable price (standard spectrometers are worth tens of thousands of dollars and very bulky). That's why Consumer Physics, the maker of SCiO, along with DietSensor, the maker of the app and the food database, has received multiple prestigious awards. – DietSensor received the highest possible distinction at CES 2016 with the “Best of innovation award” in the Software & Mobile Apps Category. 1. Purchase a SCiO scanner + Digital scale from the DietSensor online store (on this page). 2. Download the DietSensor Application from the App Store or Google Play. Once you’ve connected your SCiO to your phone via Bluetooth, you shall be subscribed to the Ultimate Plan for a year. Then, the Ultimate plan will be $79.99/year (only $1.53/week!). Ultimate nutritional tracking and coaching tool. Elected the most innovative app in the world by the 2016 CES. Includes a database of 600,000 food items and barcodes. Also includes a nutritional coaching for weight loss, obesity, and diabetes, an assistance managing cholesterol and/or a healthy diet. Compatible with Apple Health, Google Fit and 20 other fitness trackers. The SCiO scanner, conceived by Consumer Physics, an international leader in the miniaturized spectrometry, communicates directly with the DietSensor app via Bluetooth, allowing you to follow your calorie, lipid, protein and carb nutritional intake as precisely as possible. Most of the food you eat is homogeneous. Check out the list of homogenous food items covered by DietSensor through SCiO. Extras: As it has a retro-enlightened LDL screen, the scale may also be used without the App as a basic kitchen scale. Accurate graduations of 1 g, range of 10 kg, tare function, g ml oz, fl.oz units, automatic switching-off. Like other leading meal logging apps, DietSensor allows you to search food or scan barcodes. What makes DietSensor unique is the depth of our nutrition coaching advice based on your goals and our food analysis, which goes far beyond calories. Thanks to your ultrafast and accurate SCiO scanner, you will be able to easily and rapidly scan your food or beverage. Within seconds, you will see a breakdown of nutrition information displayed on your smartphone and the impact this will have on your nutrition goals, if consumed. What kinds of food scans can DietSensor read from your SCiO? You can scan any food with a single, or homogeneous, texture. In order to get an accurate result of the scan, the scanned surface of the food and its internal composition must be made of the same component. For example, mashed potatoes would be considered a homogeneous food, whereas a sandwich or a donut with chocolate frosting would not. How do I log non-homogenous foods into the DietSensor app? We want to make sure that you can log any food, even non-homogeneous foods that you cannot scan into the DietSensor app. That’s why we have embedded one of the most extensive food databases in the world, with more than 600,000 food items. This enormous database is powered by Fatsecret, a strategic partner that provides us with the best database on the market using an open API platform. You can easily and quickly log your food using a search feature or a barcode scan. What minimum system requirements are needed to run DietSensor? DietSensor will run on iPhones 5S, 6, 6 Plus, 6S and 6S Plus with iOS 9 or higher. It will run on Android-based phones 5.1 or above. How can I purchase DietSensor in my country? 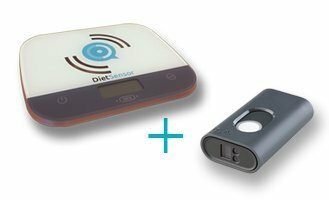 To run the full version of the DietSensor App, you need an “Ultimate” package and the SCiO scanner. You can purchase and use DietSensor from any country except China and Japan. Which languages and countries are supported by the DietSensor app? This means that everybody from anywhere except China and Japan will be able to purchase and use DietSensor, and search food in one of these 18 languages or use SCiO in English, French, Spanish, or Italian. What does the automatic weighing (digital scale) feature consist of? With DietSensor, you can indicate the weight of your portion with the touch of a finger. Unfortunately, portion estimation is often a huge source of error, and we know that our eyes will never replace a scale. To ensure maximum accuracy, we decided to connect DietSensor to a Bluetooth scale and incorporate the “Serve (and Weigh), Scan and Eat” capability. How does DietSensor help me manage my health? DietSensor’s primary objective is to facilitate food intake tracking to empower its users to follow and stick with their nutritional goals. Additionally, DietSensor gives real-time suggestions each time you scan for maximum impact and optimal results. Depending on your goals (Control diabetes, obesity, high cholesterol, etc. ), you will receive personalized nutritional advice tailored to your needs. because there’s nothing as accurate as this in the store. There is two ways to scan your food.